By attaching specialised molecules to the backbone of DNA, researchers have made it easier to detect rare molecules associated with early disease. The presence of, or changes in the concentration of, certain proteins in biological fluids can be indicators of disease. However, in the early stages of disease these 'biomarkers' can be difficult to detect, as they are relatively rare. Detecting important biomarkers in lower concentrations will allow patients to be treated earlier for diseases such as some cancers and neurological disorders, which could increase the chance of survival rate. However, current methods of detection are often not sufficiently sensitive and require costly and time-consuming sample pre-treatment. 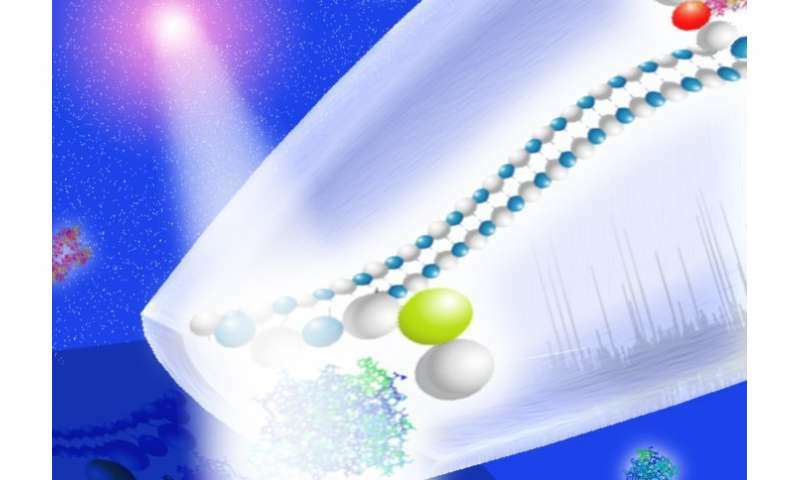 Now, researchers from the Department of Chemistry at Imperial College London have come up with a system that is specific, flexible, and can detect single protein biomarkers directly in human serum (a pool of fluid separated from blood). The system represents a significant innovation, as it is more sensitive to specific biomarkers and does not require clinical sample preparation. The method is published in Nature Communications. Dr. Alex Ivanov, co-leader of this study from the Department of Chemistry at Imperial, said: "The detection of single molecules of biomarkers represents the ultimate in sensitivity for early diagnosis. We have now shown that this is possible to perform such measurements in real human samples, opening up the potential for meaningful early diagnosis." The method the team developed uses the 'backbone' of DNA, the structure it is built around. They grafted 'aptamers' – synthetic DNA molecules that bind to specific target biomarkers – to DNA backbones. When added to human serum, the aptamers bind to biomarkers before being analysed by passing through a nanopore detector. Nanopores are miniscule holes (often as small as a few billionths of a meter) that measure a change in electrical current as molecules pass through them. Each biomarker has a unique current signature, so the presence and concentration of target biomarkers can be analysed in this way.